You took the bar in 2008. Did you self-study or did you take the more traditional bar exam review course? When I took the bar (for the first time) in July 2008 I studied on my own. A personal issue arose during that time that created a significant impact in my studies, causing me to lose a lot of study time. Unfortunately, many people have experienced the same challenge of having a personal issue affect their bar prep. For me, it was the surprise pregnancy of my first child and the physical symptoms accompanying the pregnancy that made it difficult to study. So although I failed in 2008 because of a lack of adequate preparation, I still felt confident in the self-study process for my second (successful) attempt in 2010. 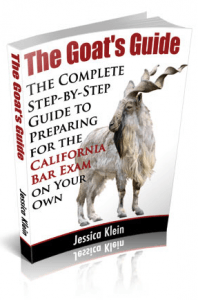 What made you decide to write your book, “The Goat’s Guide: The Complete Step-by-Step Guide to Preparing for the California Bar Exam on Your Own”? Originally it never crossed my mind to sit down and write a book. It came about because people who were taking the exam were interested in how I did a successful self-study (either because they were trying to do the same thing or because they were taking a commercial course and were dumbfounded that it was possible). I was more than happy to share some of my techniques because I didn’t want all my experience from studying & creating a study system for myself to go to waste. I thought it would be easiest to simply write it down into a standard email that I could forward to people who were interested. Once I started writing it out, however, I began to realize the scope and volume of my study system was a lot bigger than I had imagined. In order to comprehensively explain the study program, I ended up with over 100 pages of information, complete with study calendars, trackers & worksheets. 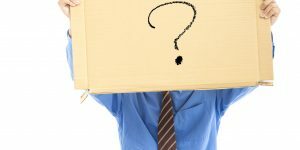 Do you think anyone can study for the bar exam on their own, or do you think it takes a certain person/student to find success studying on their own? No, I don’t think self-study is for everybody. Furthermore, I think it’s really important for people to honestly assess within themselves what they need in order to be successful on the exam. In the end, it’s about passing the exam and getting resourced with whatever gets you there. 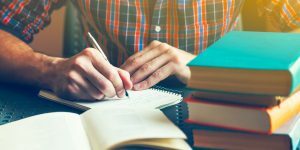 For some people, self-study is a great option, but others will do better taking a commercial prep course or will thrive by getting a private tutor. To do a self-study, you really need to be okay with being independent, self-sufficient, and self-motivated, as well as confident in your studies. You are going to be spending hundreds of hours alone in study. You will not be surrounded by lots of other people who are all doing the same thing every day, nor will you have any sort of leadership in the form of an instructor or tutor to rely on on a daily basis. If being “on your own” makes you nervous or sounds like a form of torture, self-study is not for you. If you need someone to harass you about getting things done in order to be productive, self-study is not for you. If you need to be able to talk through every legal concept you come across during your studies in order to gain understanding, self-study is not for you. All that said, I think self-study IS an option for a lot of people that probably have never even given it fair consideration. The reason being, that to be successful as a law student, there are a number of characteristics you must already possess – such as motivation, independence, etc. There are actually a lot more people who could do a self-study successfully than actually try. Thanks Jessica! 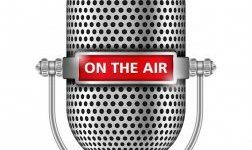 Please check out Part II of Jessica’s interview where she talks about the biggest misconceptions about self-studying for the bar and offers some tips! And if you have any questions for Jessica, please leave them in the comments. Check out more interviews with helpful people!